Comfort was a default mode, back in India. Just a year back (before the 'big move') we had moved out of my in laws place to our own rented place. We had both our parents a few minutes of drive away, we loved our jobs, loved the known neighbourhood where everybody bar few knew our names, we were dependent on our happy little elves - morning tea, breakfast and lunch prepared by our ever so helpful cook, our cleaning lady and laundry man on our doorstep everyday, we were happily set in our routines - my job, my weekly dance classes, working on the blog and The Dance Bible late at nights, visiting family and friends over the weekends - we knew what the next day would hold for us. But all that changed when we decided to move to London. We embraced the unknown - from loving my job to being unemployed, from waking up to bed tea and getting back home to a clean house to doing all things by myself, to living in a city without the warmth of family, to living in a neighbourhood where even the next door neighbour doesn't know my name. There were times of discomfort, there were times I was vulnerable and unsure, but looking back I wouldn't have it any other way. I have come to appreciate life more, I have had time to introspect and know what I really want from life, I have grown as a person and now knowing that I can swim through high tides and wade through storms, makes me more confident and sure of myself. The first 9 months in London, I reinvented myself from a career woman to a homemaker and it came as a surprise to me that I actually enjoyed it. I had sufficient time to pursue my writing, blogging, The Dance Bible. I also worked on few freelance writing projects, joined a novel writing group and steered my life towards things that mattered to me. Then, realizing the necessity of a second income, I started working full time this February and got back to the banking sector. Again Reinventing. Reevaluating. And taking each day as it comes. Not everything you hear about a person, a culture, a country is true, and stereotyping a country is even worse. Living abroad has given me interesting perspectives on what foreigners think about India, and has given me a chance to help break few of the negative stereotypes. I distinctly remember few of the conversations I've had and how at first I either became defensive or laughed at the absurdity of the questions. But later I tried to create and present a picture of my country as I knew it, in words that in a best possible way conveyed that India has and is moving forward. Not so long ago, one of my colleagues asked, rather commented in a sarcastic tone "People in India get married to dogs and trees, don't they?" At first I laughed it off, but then we delved deeper into why this superstitious ritual is still practiced in certain rural areas. How and why certain sections of the society believe that taking part in these regressive rituals will help bring astrological compatibility to the soon to be couple. Being generic is not always right, and being ignorant but still opinionated is completely wrong. Another time I was out with my colleagues for a Friday night drink. Few expressed their surprise when I clinked my beer glasses with theirs, expressing that they thought Indians to be conservative. "Not all..." I said and shared with them snippets of my life back home. Every household is different, isn't it? Sure we come from a strong patriarchal society but we are breaking through. All my growing up years, I had lived such sheltered life, sheltered to the fact that there was a world out there where women are looked down upon, where they had to struggle to make people believe in them, where they had to stand up only to be put down. I come from a family where the women are respected and treated as equals and their opinions are valued. I have always made my own decisions, my own mistakes and through it all my family has stood by me. My parents are my best friends; while I've shared a glass of beer with my Pa while watching a game of cricket, I've shared my boyfriend experiences with my Mum and sis sipping on coffee late at midnight. India is a lot of things. We need to tell the world to keep an open mind, as we do when we move and settle in their country. If I would have ever given heed to typical British stereotypes that Brits have a stiff upper lip or are rude or one should never make eye contact while traveling in Tube, I would have never found my feet around here. London has been very kind to us. I've never felt like an outsider, have received help graciously whenever needed, have never felt safer (even when returning home at eleven in the night all alone) and have met incredibly talented people. But one thing that remains a sore point with me even after a year is that this city is ludicrously expensive. To find a decent place to rent in this city for people who are on a budget is next to impossible. Living further out from central London is usually the solution but then one has to deeply rely on public transport and make a trade off with their time. From grocery to beauty salon to even dance classes, everything is steeply priced. I still feel the pinch, even now when I have stopped the mental currency conversion from pound to rupee. This is my only complaint. I've heard others crying over how crowded the London Underground Tube is, but clearly they have no idea what it is like to travel by Delhi Metro especially when one has to get down at Rajiv Chowk metro station. Another misconception that many have of London is that the city is dangerous. Sure some parts maybe rough and sure you need to be vigilant when traveling at odd hours or in an unknown area, but I have never felt fear in this city. Not like the fear I felt in Delhi, when as soon as you step out of your home, irrespective of what you are wearing, there will be at least five pair of ugly eyes on you; when in crowded public transport men take advantage and consider their right to touch you inappropriately and you have to use your elbows, bags and umbrellas to shield yourself; when going out at night is next to impossible for a woman without having to depend on their father, brother or husband. I've learnt that all you need is a smile and an eagerness to listen and empathize with people to strike up a conversation and build friendships. That I knew not many people in London, that the city was an unknown canvas didn't deter me to try and engage with people. The first thing I did when we shifted here was to find a writing group near my area. After a few random searches on Twitter I found @GreenacreWriter and went on my first writing walk. I met few great people from here and went on to work with one of them as a volunteer teaching English to kids. I was then approached by someone on Facebook to host their book event. All that was common between us was a Facebook group, and the fact that we were writers. I accepted the offer and what an enriching experience I had! We talked about writing and women empowerment, about India and the pleasures of traveling, and about the importance of giving back to your own country. I met a lovely old couple who run an NGO in Bangalore, India and amongst other people a lovely bartender who shared her tales from backpacking in India and how Yoga had changed her life. Even during my travels, I've realized approaching strangers with a smile is all you need to share your life stories with one another. After watching a Flamenco show in Seville, I got talking to a lady from America and how we both love dancing and traveling. Both our husbands were watching us from the other side of the street as we couldn't stop giggling and talking, like long lost friends. Another time I was dancing at a pub with a girl, who just few minutes before was sitting two tables away from me. As we danced she opened up to me sharing her struggles as a single mom and studying law full time. There is so much to learn from all such enriching experiences. You realize how every person has his own demons to deal with, yet they wake up each morning with a smile, feeling grateful for what they have. Shifting to London has been a lifestyle choice. We have decided to live on budget and splurge on travel. Our aim for the next three years is to explore Europe and United Kingdom as much as possible and London offers a fantastic base to do that. Imagine escaping to Spain, Portugal or Southern France to catch some sun in the peak of winters, or spend a weekend in Paris on your birthday or travel to Germany to enjoy the spectacular delights of a Christmas market! All of this is possible from London and you don't need to save up on your holidays for that. A weekend with a day off or a public holiday clubbed in, is all you need. Every time we go somewhere new, we get the opportunity to appreciate the ways of a new culture and new city. Each time we are amazed by the history, the architecture, the people, the incredible ways of nature and everything in between, and all we want to do is keep traveling. Being away from home, dealing with changed circumstances and new experiences has made M and me more in tune with each other. Having started our relationship as friends, it is easier for us to understand and support each other, but having no friends in the vicinity has made that bond even stronger. We've also realized the importance of respecting each other's space and not limiting one another. We know we are two unique individuals and apart from few common interests we are vastly different. There are days when M wants to relax at home and watch a game of cricket, while I want to be out exploring a weekend market or a book event. We give each other time and space to enjoy one's own company. Traveling together has also helped our relationship 'fly'. It gives us an opportunity to break away from the 'couple-bubble' and look beyond a Friday night takeaway and movie marathon at home.
" I don't know where I am going but I'm on my way"
Fabulous piece Aditi! It's so engaging. You really did paint a picture with your words. Now I am craving to travel. You truly took me on a journey through London and other places. Enjoyed your post. You've had some lovely experiences in these 12 months. Moving away from home helps you grow. I know I learnt a lot after leaving home 11 years ago. Things you take for granted are appreciated a whole lot more. Lovely photos! Lovely post and through your words, you kept me engaged. VT has been to London and he stayed in the Central part of London. That was the time, when I was on bed rest for my bad back condition and every day over skype, he used to say, "I will get you to London one day, Parul". Thank you for making me think of that time again. Living out of India - VT was out to HK for 4 months and the time I spent with him was like you mentioned very unique. Not so comfortable in terms of food and laundry but yes, it got us together as friends, we explored unknown places and walked hand in hand. Life is not living out of big homes but bigger hearts. Isn't it? May you fulfill your dreams Aditi and live like the way you want to. Hugs! 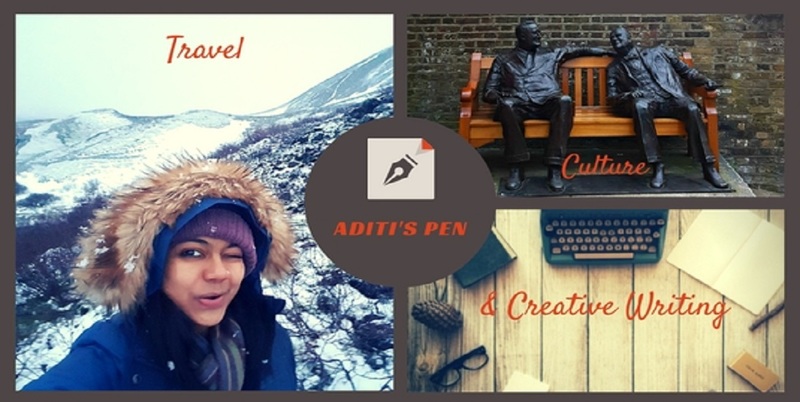 Like you Aditi, we have learned to value experiences more than material things. That makes it so much easier to travel, as does using the smiles and empathy you mentioned. We have lived in four countries as a couple and look forward to our next one. Life should be an adventure, don't you think? Wow you had quite an eventful year... absolutely beautiful experiences ... I could relate to so many of them. You have a cool family and it's so nice to hear that you openly talk about the stereotypes that people hold about India. Smile is enough to make the connection here too. Great narration and fine captures, Aditi, all the best! What an eventful year it has been for you! Some beautiful experiences and realizations I guess. I learns to value things more deeply, only when one is missing them! Enjoyed reading all about it! I am so glad you follow a no frills, live life as it comes, eat, travel and be happy way of life! All the best dear Aditi! Read this article at leisure again today Aditi You have so poignantly touched upon so many aspects of life. My little girl you've really grown up into such a mature and amazing person. I really marvel your spirit and your attitude to life.You have really made most of your first year in London.And you have constantly enriched us with the experience of your various weekend outings. This post reminds me of my first year in France, but I took almost 2 years to reach this point. I feel it's just me talking when I read your post. so many common points. Except that I had a toddler to account for too in between all this. Lovely writing! Congratulations on your one year living in London. Packing up and moving like that can be quite scary but you have made the best of it and embraced life's experiences. You live in my favourite city :) Enjoy the most of it while being there. London is a big cauldron that will absorb you slowly.